The best thing about apple pie is the fact that it is not too sweet. Not to mention, it’s a classic recipe that’s sure to make everyone think of home! A homemade apple pie recipe is easy to make and a sure crowd-pleaser. You’ll love this easy apple pie recipe. Place the flour and salt in a medium sized bowl. Using your pastry blender, cut in your shortening. Continue doing this until the flour particles have the size of a pea. Sprinkle the flour with cold water. Do this 1 tablespoon at a time. Toss the water using fork and do this until the flour is completely moistened and the bowl is clean of any pastry. Mold the pastry into a ball shape. Divide the ball into half then flatten it out. Wrap both flat rounds using plastic wrap. Refrigerate this for about 45 minutes. In the event that you refrigerate your dough beyond the recommended time, you must allow the dough to soften first before rolling it. Use a floured rolling pin to roll the pastry then divide it into 4 pieces. Put the pie crust in the pie plate. Place flour, sugar, cinnamon, nutmeg and salt in a large bowl and mix well. Stir in apples and continue mixing until all ingredients are properly combined Spoon the filling into the pastry. Cut the butter into thin slices and sprinkle all over the filling. Flatten the other pastry and fold this into four parts. You can either cut the pie dough into 2 in. thick strips and create a lattice pattern, or simply place the other crust on top. If you don’t create a lattice pattern, create some slits in the top layer of pie dough to allow the steam to escape. Place the dough top of the filling and press on the rim in order to seal. Cover edges with foil in order to avoid too much browning. Bake the pie for 30-45 minutes. Remove the foil during the last 15 minutes of the baking period. Allow to cool down a bit before serving. That’s all folks. 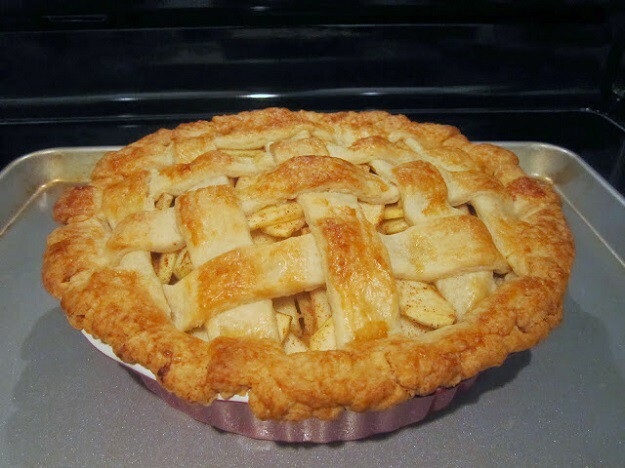 Did you enjoy our homemade apple pie recipe? Let us know in the comments section below what you thought of our homemade apple pie recipe. Do you have a favorite homemade apple pie recipe that’s been in your family for ages? Share it with us and we’ll give it a shot. We love making quick and easy recipes that you can make right from the comfort of your home. Hence the reason we started Homemade Recipes.com We want to share our love of cooking with the you! We need your help in creating a community of foodies where you can come and share your recipes and expect the best homemade food prepared by our team of expert chefs and food connoisseurs. Do you want to write for Homemade Recipes? Shoot us an e mail and make sure to stay in touch on Facebook, Twitter, and Pinterest!